Turkey’s domestically developed Bayraktar TB2 UAV is considered to have greatly contributed to the Afrin operation’s success. Turkey's Operation Olive Branch, launched on Jan. 20 to eliminate the risks posed by the PKK terrorist organization's Syrian affiliate Democratic Union Party's (PYD) People's Protection Units (YPG) militia, has been successful as the Turkish and Free Syrian Army (FSA) forces took full control of the city of Afrin Sunday. Since the first day of the operation, the TSK has been using domestically developed military vehicles, arms and ammunition to some significant extent. Prime Minister Binali Yıldırım, citing Turkey's homegrown defense systems, said that combat and reconnaissance drones, in particular, changed the course of the operation in Afrin. Speaking at the Industrial Competence Evaluation and Support Program in Ankara yesterday, Yıldırım assessed the development of the Turkish defense industry, which he considers to be a very effective instrument in ensuring the success of the Afrin operation in northwestern Syria. Citing the operations conducted by combat and non-combat unmanned aerial vehicles (UAV) in Afrin, Yıldırım said, "These combat and non-combat unmanned vehicles altered the fate of the Afrin operation and gave Turkey the upper hand." 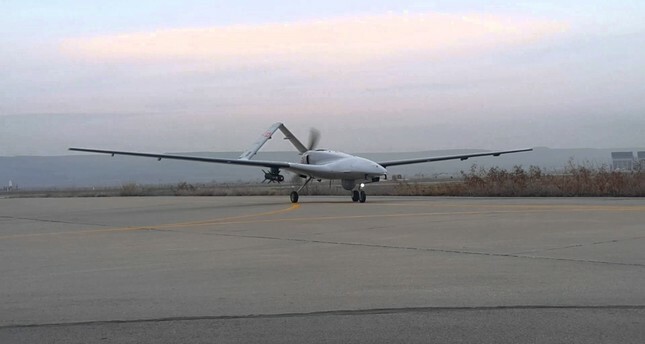 Bayraktar TB2 armed drones, developed by Baykar Makina, were used in the Afrin operation. In active service since 2015, the Bayraktar TB2 has an endurance rating of 24 hours and can reach altitudes of 8,238 meters. The system, including the electronics, software, aerodynamics, design and sub-main systems, was fully developed and produced in Turkey, allowing the country to cover its needs independently. In addition to operations in Syria, the Bayraktar is also being used in counterterrorism operations in the country's eastern and southeastern regions, where mountainous terrain poses a challenge to security forces. The drone was the first nationally made, micro UAV in the military's inventory. It was also the first domestically made UAV to be exported, having been delivered to Qatar in 2012. The prime minister spoke of the great opportunities the defense industry proposes as well as the necessity for Turkey to become self-sufficient: "Turkey needs domestically developed defense infrastructure without relying on the import of technology; otherwise, it will not be possible to become completely independent." Yıldırım said that the defense industry now has a business volume of $60 billion and will be working on more than 600 projects in the coming decade. He said that the next-generation aircraft projects, developed with other NATO countries, will amount to an estimated $100 billion, and Turkey was also thinking of renewing its air fleet by 2023. "There are plenty of projects ahead. When realizing these projects, we must also build competent firms. We cannot do this only with the publicly owned companies in the defense industry. It is an outdated model of doing business now," he said as he encouraged the involvement of private defense companies. He added that there had been projects carried out in defense before 2002, but they were rarely time-oriented or focused on economy of time. Yıldırım said the destroyer, which had occupied the agenda of the defense industry since 1985, always maintained its importance for at least 10 years to 15 years, but was never realized. "However, in 2002 we paid special attention and started to realize these projects rapidly," Yıldırım said, adding that they also took the usage of local systems from around 24 percent to above 65 percent.